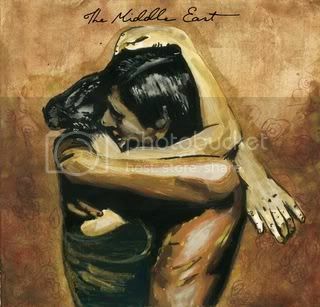 Look for The Recordings of The Middle East by the Australian band The Middle East. If you're a sucker for soft haunting melodies (and beautiful album covers and simple album and band names), you should listen to "Blood" and "The Darkest Side" and probably the rest of the band's oeuvre when it is released (10/27/2009, according to the Lala). The band's appeal has more to do with their sound that is reminiscent of Bon Iver, Fleet Foxes (and Arcade Fire, when the girls chime in) than their vampiric song titles. As for ever seeing The Middle East live, KEXP makes a good point, "The problem with falling for an Australian band: they are always playing Australia."